Fancy flying across the 'Big Island of Hawaii'? Than Microsoft Flight might be just the ticket, offering a load of real-world planes to fly over real locales, from an exotic island paradise to sprawling cityscapes, all of which will be bolstered by additional DLC. 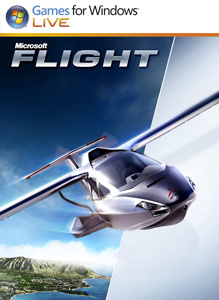 You can sign up to join the Microsoft Flight beta here, or wait until it releases as a free download this spring, at which point signing in via your Games for Windows Live account will automatically earn you free add-on content. This free DLC includes the legendary Boeing Stearman plane, extra missions, access to achievements and an Online Pilot Profile to log your stats. There'll be daily challenges to complete too, and you'll also have the opportunity to virtually fly the all-new ICON A5 before real-world production of the aircraft begins at the end of 2012. Microsoft Flight will be taking off on GFWL this spring. Just increased my gamerscore by 5 points by crashing my plane into a hot air balloon during the tutorial. Game's (probably) fun. I actually hate flying games, which is a result of a common childhood traumatic experience. Celebrate aviation history with the RED TAILS P-51 Mustang! This plane was made famous by the Tuskegee Airmen, who proved themselves in the skies during WWII, even as they battled discrimination on the ground. This special aircraft is brought to you by Microsoft Studios and RED TAILS. RED TAILS is available on DVD and Blu-ray. Learn more at http://www.youtube.com/RedTailsMovie. Free download that contains universal land-class textures and annotations for worldwide coverage. Free download that contains land-class textures and annotations that apply to cold climate areas of the world. Free download that contains land-class textures and annotations that apply to gridded, urban, and wet, climate areas of the world. Free download that contains base geographical data for all of Alaska. Free download that contains seasonalized, autogenerated scenery objects, generated missions, and 3D art assets used worldwide. Free download that contains land-class textures and annotations that apply to temperate, wilderness, climate areas of the world. Explore the exciting world of bush flying and get those hard-to-reach Aerocaches in the Carbon Cub! Cub Crafters' modern, high-performance aircraft reinvents the classic plane using carbon fiber, computer-aided design, and sporting a lightweight 180-hp engine for spectacular performance. Expand your world: This versatile, cargo-capable aircraft allows you to take off and land just about anywhere! A king-sized bush plane that's perfect for the wilds of Alaska, the C-46 was originally built as a cargo and troop transport during WWII. This twin-engine aircraft can carry up to 17,000 pounds of fuel and cargo to almost any remote and rugged landing strip. Its relatively high cruise speed of 200 kts and max range of 1500 miles make it the perfect cargo aircraft for Alaska. No cockpit is included.